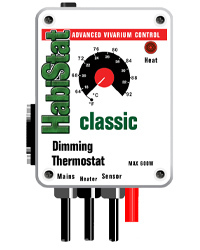 Dimming thermostat with the capacity to drop the temperature at night if attached to a timer. The function of this thermostat is the same as the standard Dimming thermostat, but with the added facility of a night time temperature drop ability. With many species it is important to give them a cycle of warm day time temperatures and cool night temperatures. Many species would experience this in their natural environment. Through an additional mains input lead and via a time switch or a Habistat 'Night eye' (not included) the thermostat will lower the set temperature for a period of time set on the time switch or controlled by the 'Night eye'.